Preheat oven to 350 degrees. Combine soup mix with water; bring to a boil and reduce to a simmer. Add potatoes, vegetables, and chicken. Simmer for 15 minutes stirring frequently; Pour mixture into a 9x13" baking dish. Cover with pie crust and bake approximately 20 minutes or until crust is golden brown. Let rest 10 minutes. Serve! -Use your own fresh veggies instead of frozen. Stir in 1 cup shredded cheddar cheese just before adding mixture to baking dish. 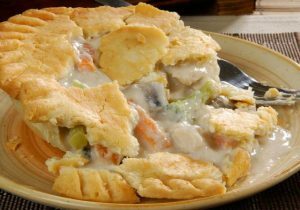 -Instead of a 9x13" baking dish, use 6 smaller baking dishes for individual pot pies!